Sviatoslav II Yaroslavych [Svjatoslav Jaroslavyč], b 1027, d 27 December 1076 in Kyiv. Kyivan Rus’ prince; son of Yaroslav the Wise. 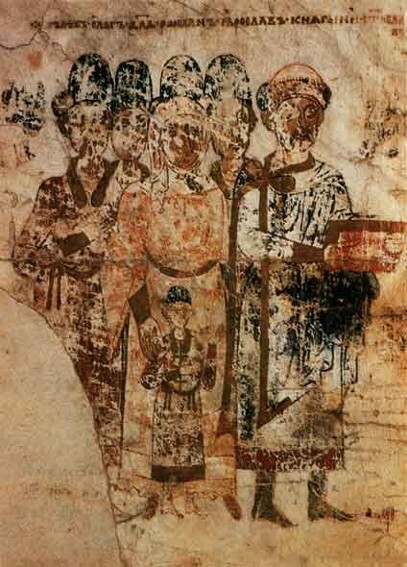 Sviatoslav ruled in Volodymyr-Volynskyi while his father was alive and then became prince of Chernihiv (from 1054). At first the three oldest sons of Yaroslav ruled in harmony; together with Vsevolod Yaroslavych, the prince of Pereiaslav, and Iziaslav Yaroslavych, the grand prince of Kyiv, Sviatoslav defeated the Torks in 1060 and Vseslav Briachislavych, the prince of Polatsk, in 1067. In 1068 he and his brothers took some losses from the Cumans on the Alta River near Pereiaslav, but later that year he himself won a significant victory over the Cuman forces on the Snov River in Chernihiv principality. With Vsevolod's help Sviatoslav deposed Iziaslav on 22 March 1073 and took over as grand prince of Kyiv. During his rule the territory of Kyivan Rus’ was greatly increased. He was a patron of education, and he sponsored the compilation of Izbornik of Sviatoslav (1073) and Izbornik of Sviatoslav (1076), which had a great influence on the further development of educational literature in Kyivan Rus’. Sviatoslav also contributed to Ruskaia Pravda, notably a chapter called ‘Pravda Iaroslavychiv’ (The Law of the Yaroslavych Dynasty). He was buried in the Cathedral of the Transfiguration in Chernihiv.